Attack of the Frankenpattern + Meet my new sewing friend! This weekend was full of new experiments! I cooked up my first “Frankenpattern” (i.e. a combo of two or more different patterns) in my “lab” – a combo of the Lady Skater Dress and the cowl version of the Renfrew Top. I love both patterns, and when Sarah at Grey’s Fabric and Notions told me about this particular combination, I knew I had to try it. Voilà! 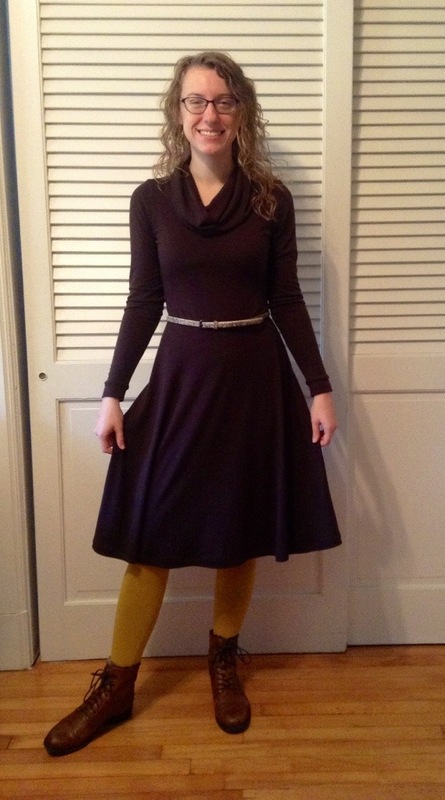 I love many things about this dress – it’s warm (thanks to the cowl and longer sleeves and skirt) and it was super easy to make! I didn’t have to make any alterations to add the cowl – I literally just cut the whole Lady Skater pattern minus the neckband and cut the Renfrew cowl instead. Of course, I sewed both shoulder at the same time, since I wasn’t adding the neckband piece. One note – I did match the shoulder seam notch on the cowl pattern to the shoulder seams of the dress, which meant stretching the cowl a little through the back. I did this to take in extra fullness through the back neckline – usually, the neckband takes care of that part, and I wanted to make sure I didn’t have a gaping neck in the back. Not bad for my first Frankenpattern! My second big experiment this weekend was – drumroll please – my new serger!! Meet the Pfaff Hobbylock 2.0, purchased at Grey’s over the weekend. I was timid about making such a big investment, but it’s already paying off! Since I sew soooo many knits, I knew I probably needed a serger, so I took the plunge. And I love it! Of course, it’s taken some getting used to, and there was a lot of frustration at the beginning – the first thing to happen when I got it home was that the threads broke and I had to re-thread the whole thing – agh!! But I learned a ton from my initial disasters, and now my serger and I are becoming fast friends. 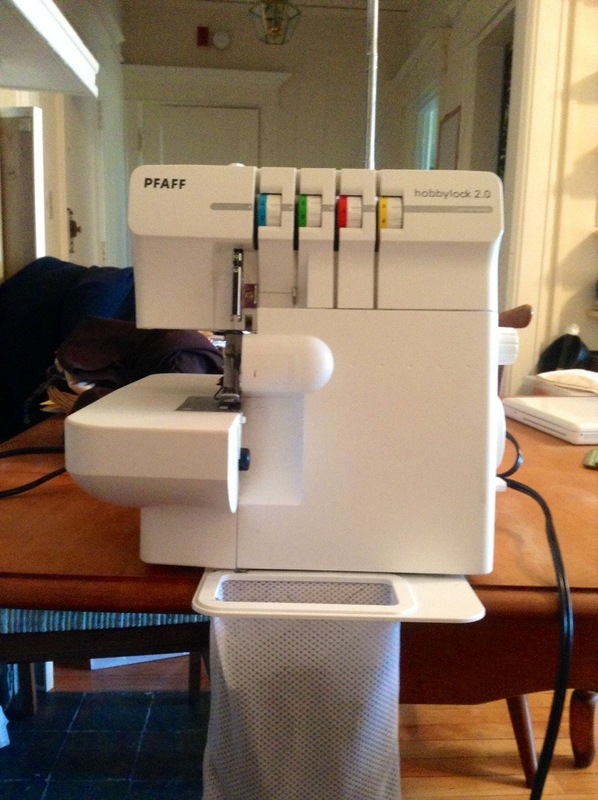 One thing that helped a lot – it turns out my mom is a Pfaff serger expert! Yes, really. She used to teach serger classes at her local fabric store before they closed. So after a frustrating first attempt at a garment (which I will show you later, after I’ve recovered from that trauma…), I got a private serger lesson via Skype. Totally awesome! So, my new dress was also made on the serger. It was super fast and not nearly as intimidating as I has feared! One other comment before I leave – Grey’s Fabric and Notions is pretty much my favorite place in the world. If you live in Boston, or near Boston, and need fabric, sewing machines, or anything sewing related, I highly recommend them! They have a wonderful fabric selection and the staff are suuuper helpful and knowledgable. Enjoy!